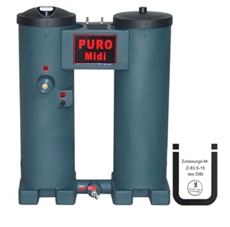 The PURO MIDI is designed to separate oil from condensate that is extracted from compressed air systems. The PURO MIDI condensate separator covers compressor capacities up to 20 m³/min. Polypropylene has the perfect effect on oil. It attracts oil and captures it, almost as if it draws oil like a magnet. That simplicity and our technology are at the root of the PURO MIDI’s efficiency to clean virtually all types of condensate, emulsified or not. The typical output oil residue value is less than 10 ppm. All PURO MIDI models can accept condensate discharge from intelligent drains, timer drains, float drains and manual drains.